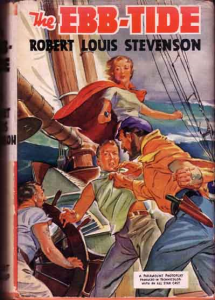 The Ebb Tide is a short novel written with the help of Stevenson’s stepson, Lloyd Osbourne. The novel tells of three unscrupulous men entrusted to deliver a cargo of champagne aboard a ship whose crew has died of smallpox. The three embark on a drunken voyage, only to discover an island whose sole European inhabitant, Attwater, has amassed a fortune in pearls. The Ebb Tide was published the year Stevenson died.